Going back 30 years, we've had 25 November days where we failed to hit 40 degrees. As of now, it looks like we add two more to that list as Sunday and Monday are looking pretty likely to avoid the big 4-0 for a high. It's been five years since we've been there -- so that's a bit of a rarefied accomplishment for the region. There really isn't a strong correlation between November cold shots (a couple of days of such chill) and what happens in the proceeding winter -- you can see the list of dates to the left include such crappy winters from a snow standpoint as 1996-97 and 1989-90. 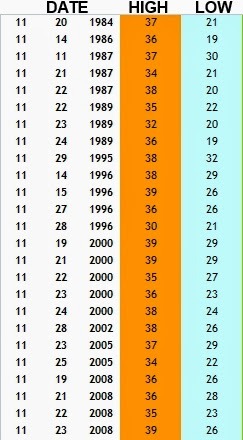 Some winters do perform -- 2002-03 and 1995-96. Some are in between -- 2000-01, 2005-06, 2008-09. If anything, one trend that comes out of these is a bit more volatility than what one normally gets in a Philadelphia winter -- most of these winters performed quite well in being a bit wild from a temperature standpoint and producing some rather cold air mixed in with warmer interludes. For instance, December 1984 was quite warm (with a 70+ degree day in late December! ), January 1985 quite cold (failing to hit 10 degrees for a high on January 21st). The November 29th, 1995 38 stands out as well for a couple of reasons -- one is the high the preceding day was 66 degrees...the second was that the 38 was a Midnight high and that nearly two inches of snow fell in Philly that day. That winter of course included the Blizzard of '96 in early January...followed by 60 degree weather less than two weeks later. 2008-09 featured quite a few yin and yang moments for temperatures -- highs in the 20's one day, 60's a couple of days late (December 2008, February 2009) and yeah, some snow along the way. Temperature variation is not unusual in Philadelphia -- it is a common theme around here in many a winter even if there is favorable blocking in place more often than not. That said, if the trends from past winters do hold we might see a bit more of a roller coaster around here this winter in the temperature department than usual in the months ahead based on the dip in temperature ahead.